Sometime last year, I got food poisoning from eating poke. I had ordered a bowl from a random place through Door Dash for lunch, and after feeling like death the rest of the day, I couldn't touch the stuff for a long time. 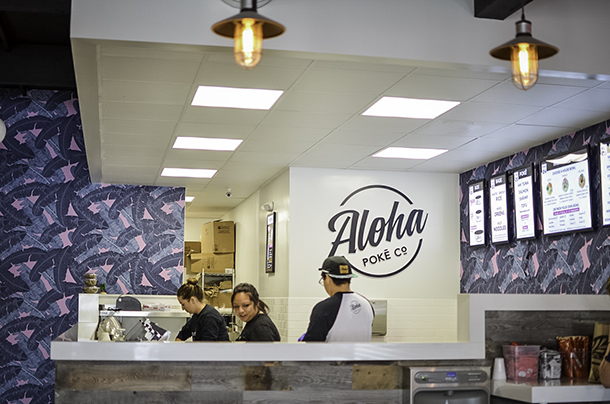 Needless to say, I've been wary about trying new poke places, but when Aloha Poke reached out to me to invite me to try their Costa Mesa location, it seemed as good a time as any to put my fears to rest. I'll be the first to admit that I've never been a food blogger, but I've not so secretly been wanting to become one. I love sharing new restaurants, and ever since I decided to stop being embarrassed of still living in Orange County, I've been more eager than ever to talk about good food in the area with whoever will listen. All of this is to set the scene for my lunch with Aloha Poke. Simultaneously excited to make my mark as a "food blogger" and worried about getting sick, I walked into Aloha last week on my lunch break, and I walked out full, fat (unrelated to the poke), and happy. 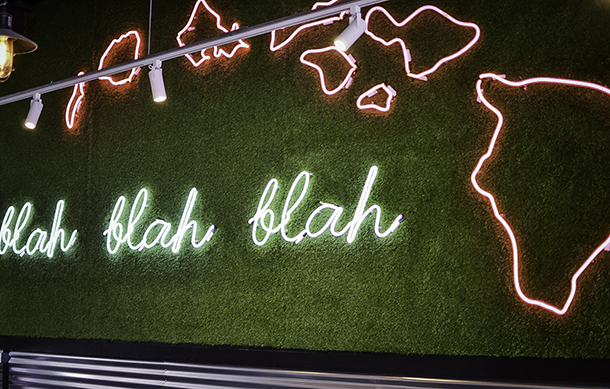 The restaurant is super cute and Instagram-worthy with neon accents, which if I'm being honest, is more enticing to me than I'd probably like to admit. I had of course eaten traditional poke bowls, but I had never tried Hawaiian poke, which ended up being the perfect mix of savory and sweet. 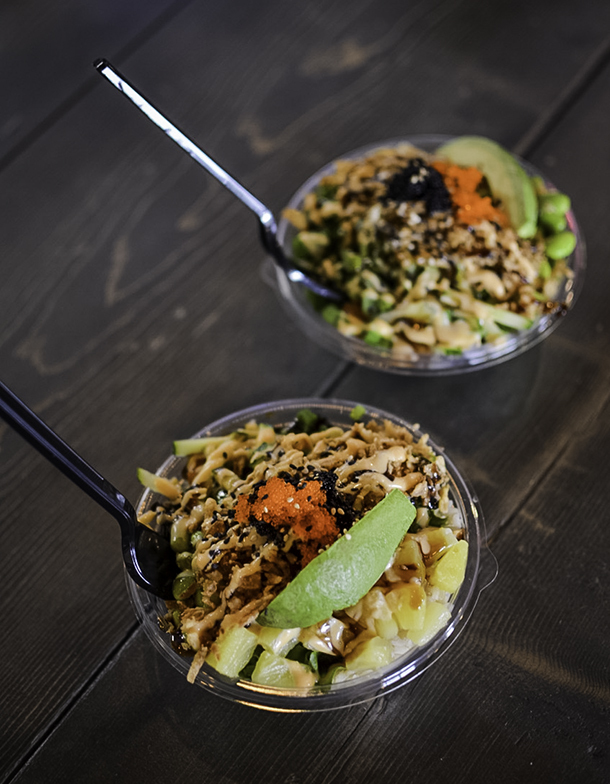 I was lucky enough to try a few items on the menu, and the most I ate was of the Crunch Bowl, which I got with salmon, their signature aioli sauce, and included a seriously delicious mix of crunch and edamame. One of the best surprises though? The Walkin' Poke appetizer. If you've ever had a walkin' taco, the mix of Frito's with poke really shouldn't come as a surprise, but man, I was not expecting that to be that good. As someone who really struggles to eat healthy and would choose mac & cheese over a salad 100% of the time, it's always a huge relief to find food that's healthy, made with truly fresh ingredients, AND is extremely tasty. Any good restaurant review should really be about the food, but what I was even more taken with was the business itself. 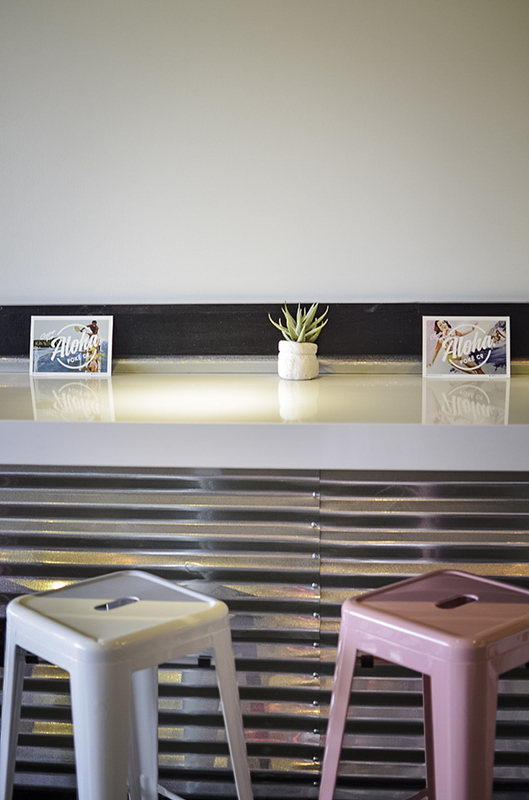 The small chain started in Chicago - which of course appeals to my Midwest college days - and the restaurants in California are operated by an all-female team who are driven, funny, and like to wear "Support Your Local Girl Gang" sweatshirts. And sure, I may be a biased feminist who judges people based on how many feminist articles of clothing they own, but I am who am. 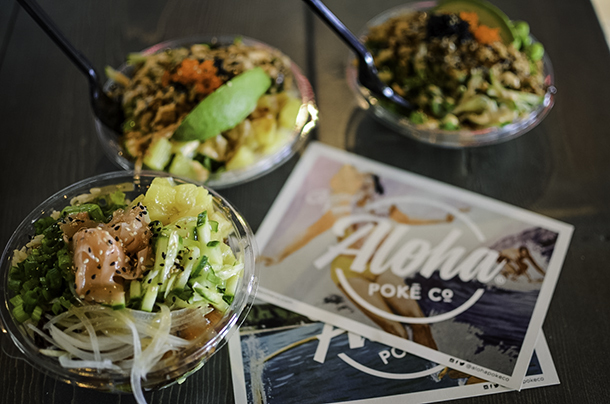 Aloha Poke also partners with Goodwill, and the team couldn't speak highly enough of their experience working with a group of disabled young adults to help sticker their bowls before distributing to the other locations. 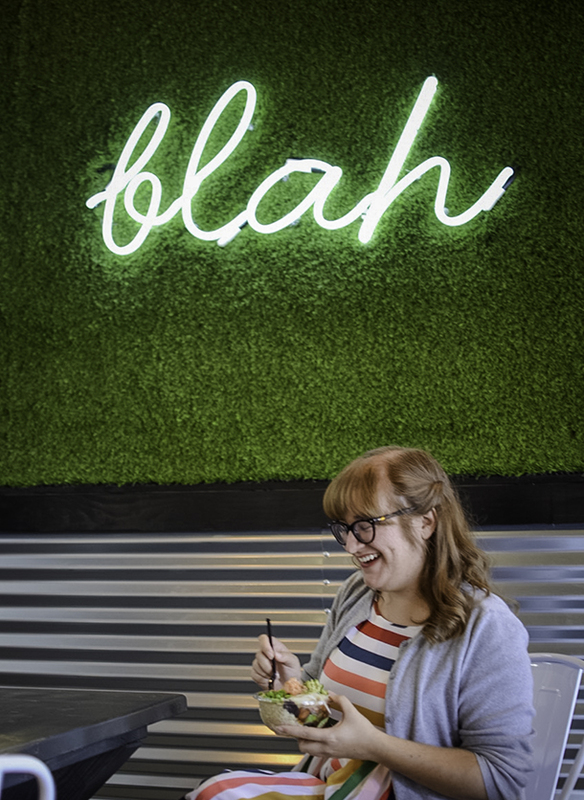 In all honesty, I was a little confused as to why a poke place (even a cute, delicious one) would have any interest in working with a vintage style blogger, but after spending lunch with their team and learning about their company culture and commitment to the community, it was easy to see why someone might think I would like it. They weren't wrong. If you're local to Costa Mesa or any of their other locations, I can't recommend Aloha Poke enough. It's hard to say that without sounding fake and sponsored, but I truly mean it. I was incredibly impressed with the food and the atmosphere, and I can't wait to go back. Or maybe order in. I'm lazy, but I won't let that stop me from eating more of this stuff. Also, needless to say, I did NOT get food poisoning or sick in any way this time. Now I can eat poke all the time without fear! 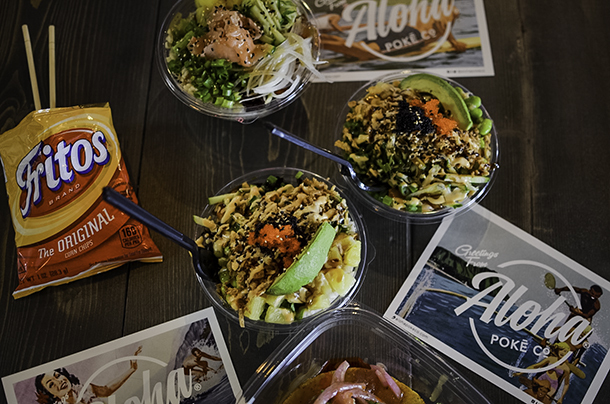 *Food was provided to me at no cost by Aloha Poke, but all opinions are my own.